Traditional Saunas have been an integral part of people of Scandinavian communities for over 2000 years and approved by generations and generations for its health benefits. 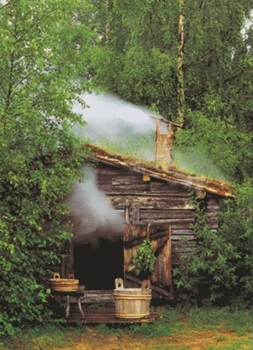 Traditional saunas became more popular in the U.S. after the electric Sauna stove was developed in the 1950s. Athletes use Saunas to improve their range of motion and to help loosen tight muscles after a hard workout. When your body is relaxed your mind feels better and you feel better. The Sauna promotes a wonderful sense of well being. Provides a cardiovascular workout--helps condition the heart. Finnish researchers have reported that the regular use of Saunas helps maintain the blood vessels. Vessels become elastic and pliable longer due to regular dilation and contraction from the process of heating and cooling the body repeatedly. The heart rate increases in the Sauna creating a demand for more oxygen, which in turn burns calories and provides a mild workout for the heart. Blood vessel dilation brings blood closer to the surface of the skin and, as blood vessels expand to accommodate increased blood flow, circulation in the extremities improves.